Angela Light (born on March 23rd, 1987) is an experienced American heroine, who is accompanied in her own business. She is a former PRIMUS agent, making her way around the nation as a female archer. She evidently has no form of supernatural ability; being the intelligent woman she is, Angela is an inventor who walks around with bows and arrows in her quiver case with quite the confidence. She is an associate to many heroes in Millennium City, gaining more allies and archenemies each day. Light depends on technology, as it favors her fees, and current hometown in City Center MC. The human female was born in Washington, DC. Living with two parents and no sibling in a lousy household, she didn’t have the brightest childhood any juvenile would hope for. Her father, a basketball varsity head coach in high school, paid no attention to Angela when aging maturely. It was the same for her mother, as she was a drug addict. Nothing ever crossed her mind without the thought of cigarettes leaving her life. As a teenager, she had went to Dunbar High School, acing straight A’s for her regime. Her knowledge was beyond great compared to many students in the school, and she graduated in the class year of 2004 at the age of seventeen. Though, in between the events that happened from education and home, Angela didn’t have the brightest childhood she dreamed of. Sure, she was in an upper class family, but her parents treated her like waste. Walking home from school one day as a Junior, she came across an alley where she witnessed thugs smoking, compromising deals, and etc. Trying to avoid them quickly, each of them took notice and chased her down. Angela desperately dropped her books and backpack, in rush to escape them. Unfortunately, they eventually grasped her and did horrible things to her; sexual assault, with an exception of handgun threats. Traumatized by the attack, her goal was to become defiant towards those who wished to take advantage of her in any way again. Her parents brushed off the desperate news that Angela told them and spoke cruel names of her. By that, the teenage girl wished to no longer have anything to do with them. Joining the PRIMUS (Paranormal Research and Investigation Mission of the United States) organization, she had become a skillful agent. She was given a rare mission deep in the Canadian mountains, which she successfully concluded. 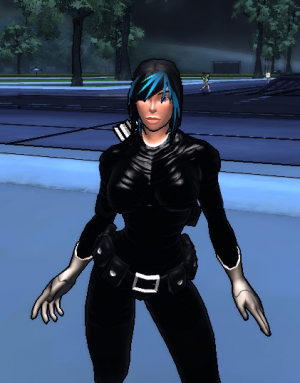 Impressed with Angela’s gift of talent, Silver Avenger Mayte Sanchez ascended her ranking as ‘Lieutenant’. After a times worth of being under PRIMUS, Angela decided to call it quits. She gathered her own technology and company with the help of PRIMUS, giving her a major loan. Looking through different sorts of gadgets, Angela found interest in Archery. Inventing bows and arrows, she upgraded many from the help of her wealth. Years into working independently, Angela had been struggling with fighting crime ever since she became wealthy. Varieties of super powered criminals were not her fairest rivals. Upon one day, at the end of the week, Angela was retrieving her payment for her work west of Millennium City. Taking public transportation, she was driven toward the street of the WCOC Television Station. She witnessed mobs of fan boys and battle bots surrounding the building. Eyeing them suspiciously, Angela descended at a stop nearby the center, and maneuvered to taking down each mob with her sonic arrows. Entering the building with stealth, she made her way into the station. It wasn’t long until she witnessed Foxbat acting like a fool in front of the cameras. Confident in taking him down, the female archer intervened on the villain’s mayhem and attacked. Foxbat’s gadgets seemed too great in comparison to Angela’s archery skills as she struggled hard to maintain herself against the crazy maniac. Gathering a mastermind plan, she eventually defeated him by the use of her high IQ. She gained the knowledge that Foxbat was just an ordinary human with extraordinary gadgetry. Rob Mahogany, one of the employees of the network station, was quite graceful of the save. Angela was televised and introduced by the WCOC, giving her retribution and publicity a boost. This page was last modified on 2 April 2014, at 20:58.